This cultivar originated at the University of Saskatchewan, bred by Rick Sawatsky, selected and tested as University of Saskatchewan 70-20-01, and was introduced in 1999. The tree is semi-dwarf, spur-type, moderately vigorous, round topped, with excellent wide-angled branching habit, and requires annual thinning. It is precocious, hardy at least to zone 2a, bears high yields annually, but is moderately susceptible to fireblight. The fruit is 5-7.5cm (2-3") in diameter, regular, slightly oblate, and matures in early-mid season from late August-early September. It has a medium stem cavity with a very short pedicel, deep basin, and a very small, nearly closed core. The skin is soft, thin, light green turning to light yellowish cream with a pink blush. The flesh is pure white or tinged pink, fine textured, medium crisp yet tender, juicy, mildly acid, medium sweet, and highly resistant to oxidation (browning). It is good for fresh eating, excellent for cooking, for pies, as well as for drying and as a fruit leather base. It stores well for about 6 weeks. 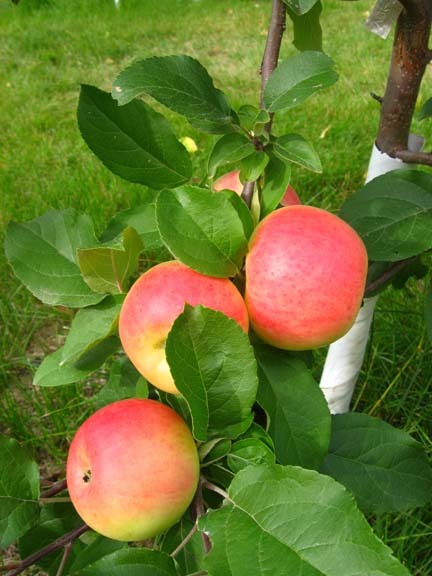 This apple has commercial potential for processing for the prairie region. Both our Prairie Sun trees fruited in their 4th year. The photo above is of apples on a 4-year old tree.